Alberti's Window: Super Bowl Bets Extend to Museums! Super Bowl Bets Extend to Museums! In true art-history-nerd fashion, I did not realize that the Super Bowl was next Sunday (February 7th) until I read this art news article from today. It's common for people to place bets on the outcome of Super Bowl games, and it looks like art museum directors are no exception! The directors of the Indianapolis Museum of Art and New Orleans Museum of Art have agreed to wager items from their collection in order to support their hometeams. If the New Orleans Saints win, then the Indianapolis Museum of Art will send Turner's The Fifth Plague of Egypt (1800, shown above) to be displayed in the New Orleans Museum of Art for three months. 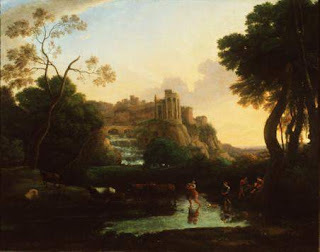 In turn, if the Indianapolis Colts win the Superbowl, then the New Orleans Museum of Art will send Lorrain's Ideal View of Tivoli (1644, shown below) to be displayed in the Indianapolis Museum of Art for three months. It appears that the bet was instigated and encouraged by Tyler Green, whose writes the Modern Art Notes blog. You can see Green's Super Bowl post here. I honestly have no opinion as to which team is going to win the Super Bowl. But if I had to root for one, I guess it would be the New Orleans Saints - purely because I think the Turner is an interesting painting and it should have a chance to travel for temporary exhibition! Is anyone else rooting for one painting to travel over another?